Outback Pioneers award-winning outback experiences and holidays, in Longreach, invite you to unleash your own pioneering spirit. You'll be thrilled when taking your seat on Australia's only Cobb and Co stagecoach gallop along part of an old mail route. Or absorb the changing colours on the original Thomson River cruise as you sail from sunset to starlight on a paddlewheeler or the historic riverboat. The Starlight's Cruise Experience also includes a stockman's dinner by the campfire and bush entertainment. There's nothing quite like the Harry Redford Old Time Tent Show with its mix of mayhem, animal antics and crazy humour. 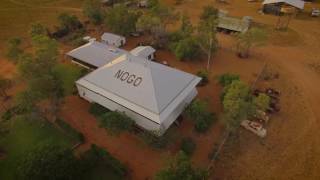 And you must visit historic Nogo Station - a working sheep and cattle station where you can see a shearing demonstration and go on station safari by double-decker, open-top overlander bus to spot animals that call the outback home. The station visit also includes a generous home-baked 'smoko' (morning tea). There's also a Winton Discovery day-tour, which visits the Australian Age of Dinosaurs Museum, Dinosaur Canyon, and the new Waltzing Matilda Centre. Whichever of the experiences you choose, you will be sharing a real outback experience with genuine outback people who live and breathe the region's past, present and future. 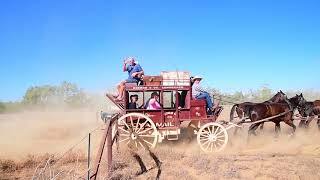 Outback Pioneers' air-conditioned coach tour to Winton travels the 180 kilometres from Longreach and gives a local's insight into the scenery and highlights. Winton is a fascinating outback town known for its dinosaur fossils and the Australian Age of Dinosaurs museum is one of the highlights of the tour. The experience includes entry to the impressive Dinosaur Canyon. Follow in the footsteps of Banjo Paterson with lunch at the legendary North Gregory Hotel, where Banjo Paterson first performed Waltzing Matilda. Explore even more about this unofficial national anthem in the purpose-designed Waltzing Matilda Centre. The Winton Discovery Experience runs on Saturdays. Bookings are essential. Outback history and a contemporary working station come together at Outback Pioneers' Nogo Station near Longreach. The station was originally part of the famous Bowen Downs station and is now the home of Abigail (née Kinnon). You'll get up close to the action with a sheep-shearing demonstration in the historic shearing sheds and discover the homestead's fascinating past, including its links to local legend Captain Starlight. A highlight is the station safari by open-top, double-decker, overlander bus which takes you over the sunlit plains where wedge-tailed eagles fly. Local wildlife mingles with iconic cattle breeds, stock-horses and the famous merino sheep. It’s a photo opportunity extraordinaire with outback desert camels, kangaroos, emus, wild donkeys and more. You’ll also visit a typical outback billabong and the ruins of Captain Starlight’s stockyards. Back at the homestead, a generous smoko awaits. It features goodies from Abigail's Outback Range, all cooked at Nogo Station. The Outback Pioneers air-conditioned coach will pick you up from your accommodation and take you around the historic sites of Longreach before travelling the 15 kilometres out to Nogo. It runs Tuesday and Thursday mornings from 7.45am to 11.45am. Bookings essential. Re-live the heyday of stagecoach travel with Outback Pioneers' unique and award-winning stagecoach gallop. On the Cobb and Co experience you'll travel in a restored stagecoach - first at a leisurely pace through town and then full-tilt along a stretch of the original Longreach to Windorah mail route. Hear the pounding hooves of the magnificent horses on the outback dirt road. Hear the rattle and creak of the coach. Hold on to your hat for the only stagecoach gallop in Australia! It's exhilarating. It's entertaining. And it's the closest you can get to feeling what it would have been like in the pioneer past. After the ride and photos, slow down with a traditional smoko (the original Aussie tea break), a classic Australian movie in retro cinema seats and their Harry Redford Old Time Tent Show, which has fun for all the family in a tribute to the old travelling shows. The four hour experience starts from the Station Store in Longreach - bookings essential. The Cobb and Co Stagecoach Gallop and Harry Redford Old Time Tent Show can also be booked separately. This is Aussie outback humour and ingenuity at its best presented by the Kinnon family troupe and their four-legged friends! It's a hilarious hour of entertainment featuring animals, stockmen and improvised live theatre with a laugh a minute. Kids love it and so do adults. Based on the traditional outback travelling shows, it's hard not to be charmed by the simple delights of bush theatre - but be warned - the folks in those days didn't have quite the same standards of political correctness so you'll need to leave your high horse at the gate and share a few old-fashioned jokes in the good-natured spirit they are intended. The show commences at Monday to Friday at 12 noon. This is part of the Outback Pioneers Cobb and Co Stagecoach Experience or can be booked separately. Make sure you don't miss Outback Pioneers' cruise to experience the only paddle-wheeler west of the Great Divide or the historic Thomson Princess Riverboat and enjoy an adventure to the heart of outback tradition. After a gentle cruise down the majestic Thomson, where birds flock home to roost on the riverbanks at sunset, they go ashore for a traditional stockman's camp-fire dinner under the stars, followed by bush poetry with a local outback storyteller. Next, the bush is illuminated by the Starlight's Spectacular Sound and Light Picture Show - a unique big-screen presentation featuring the Kinnon family and locals in the amazing adventures of the notorious cattle thief known as 'Captain Starlight'. This movie is a tribute to the bush skills of the rogue drovers and was specially commissioned by Outback Pioneers to celebrate this story of audacity and daring. Finally, in the atmospheric surroundings of the bush at night, enjoy the timeless favourite - billy tea and damper. The tour departs Monday to Saturday 4.45pm - bookings essential.